Text and photographs by, and copyright of, the Author unless otherwise credited. 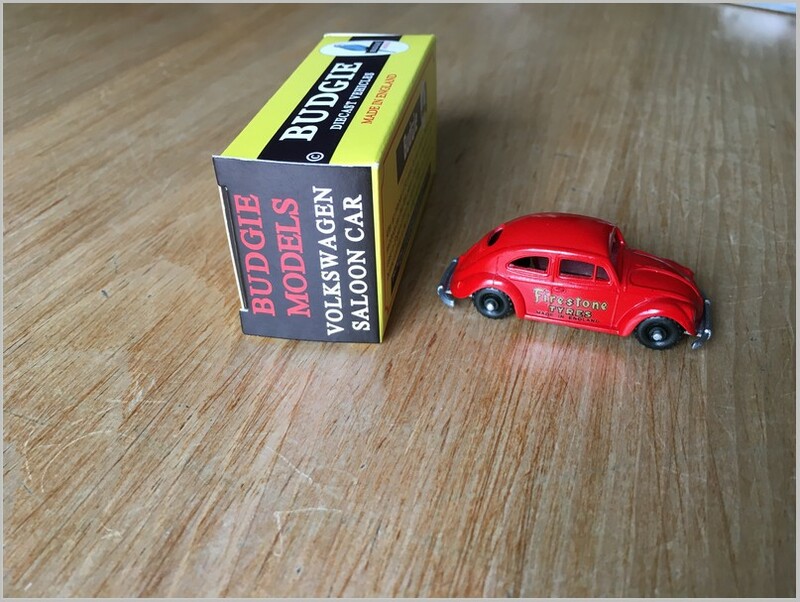 Budgie Toys is alive and well in the capable hands of Dave Gilbert, owner of Autocraft and DG Models (see https://www.budgiemodels.com and http://www.autocraft.plus.com ) and, of course, the Budgie trademark, along with some of the original Budgie tooling. 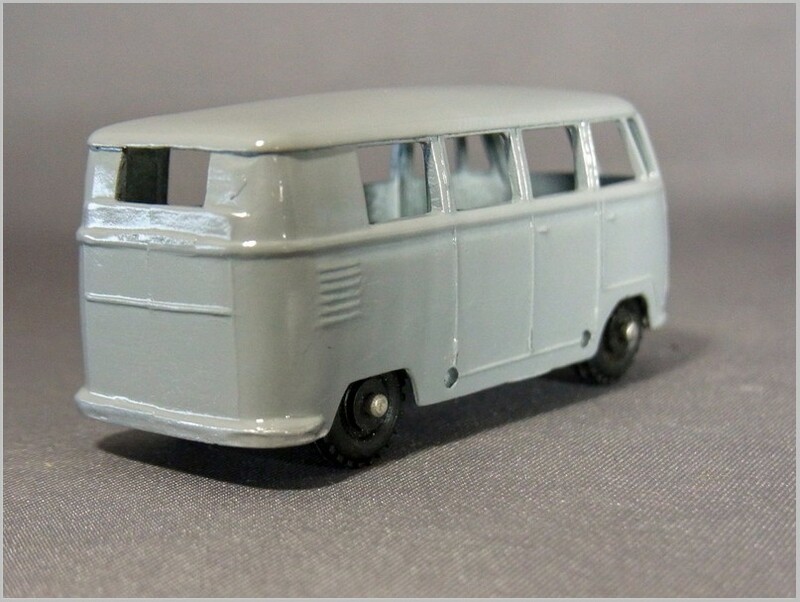 He has recently reissued the Volkswagen 1950s Saloon (an oval window, as per the original) and the Volkswagen 1950s Micro Bus in diecast zinc using the original moulds. 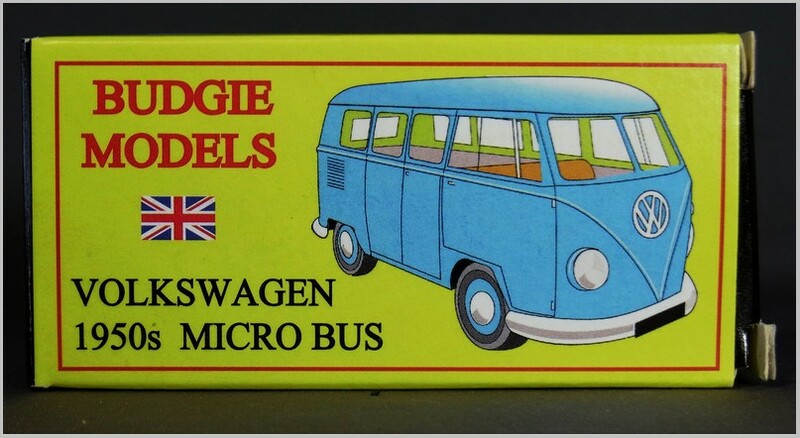 A Budgie Facebook page entry for February 3 (https://www.facebook.com/budgiemodels/) indicated that the Beetles and Micro Buses were sold out but would be restocked soon. Models are available from his website and eBay. I bought mine from the eBay store in April, and the cars are still available on eBay when this article was written – 10 pounds plus shipping. Pictured below is the Volkswagen Beetle with Firestone Tires advertising livery (perhaps meant to be a service vehicle, but a Volkswagen couldn’t deliver much more than valve stems or inner tubes). The vehicle also comes in many other colours, unlike the original from 1956, which only came in a metallic silver blue. 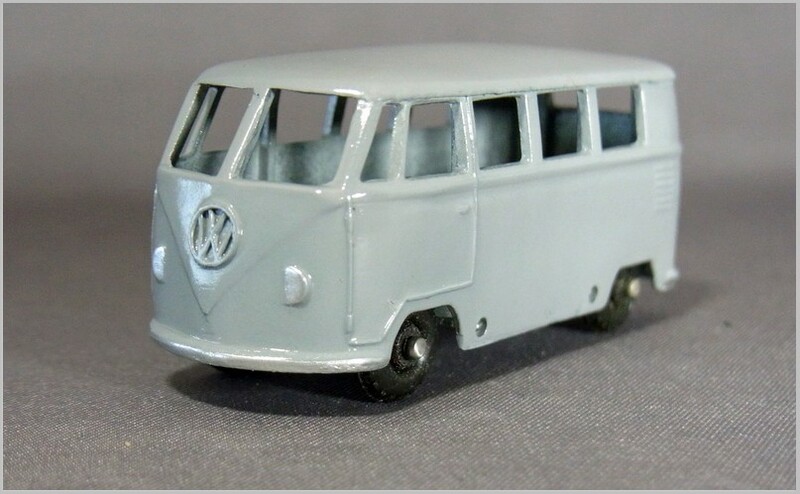 Other than colours, there is only one difference between the reissue and the original, and that is the addition of tiny axle mounted spacers between the chassis and the wheels to improve the overall stance of the model. This also allows one to determine if a model in hand is an original or a reissue. 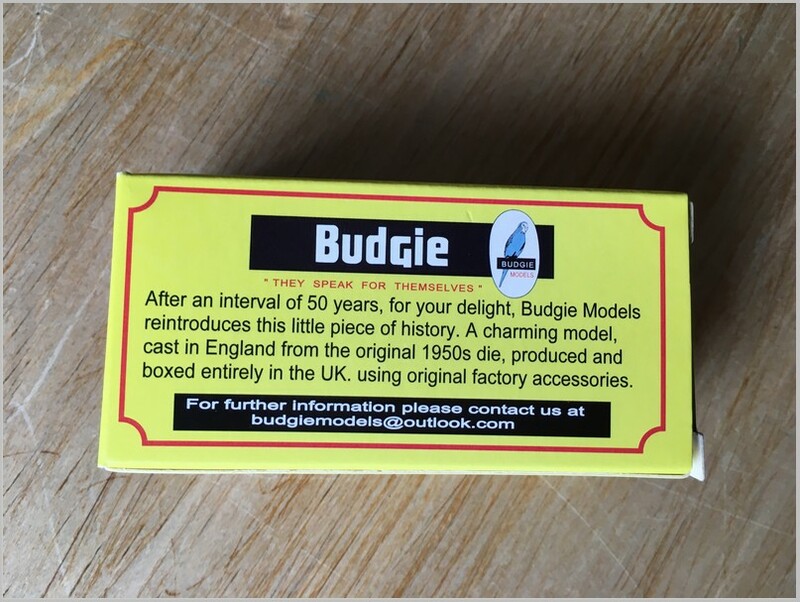 The box is also a new “Budgie Models” box while the original was issued in an “ESSO” or “Modern” box, or a Budgie blister pack. 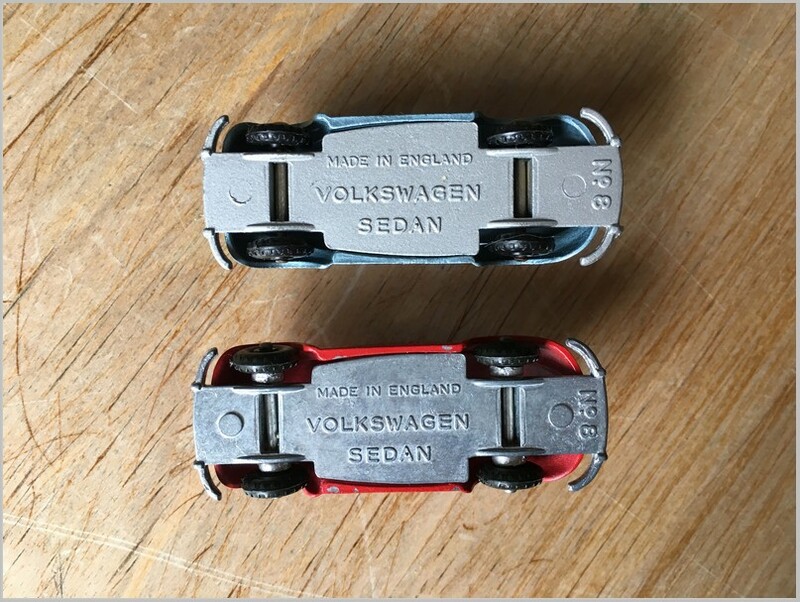 According to the UK based model historian, Robert Newson, the original was always a Modern Products casting, and is exceptionally fine, better, in my opinion, than the Matchbox Volkswagen Beetle that appeared four years later, even though the Matchbox had an opening boot with representational motor, and fairly good glazing. The dies have aged incredibly well, as the reissue is also an impeccably clean and detailed casting. Perhaps Mr Gilbert had to “clean up” the dies a bit, but one would then expect the casting to be a shade different, but it isn’t. 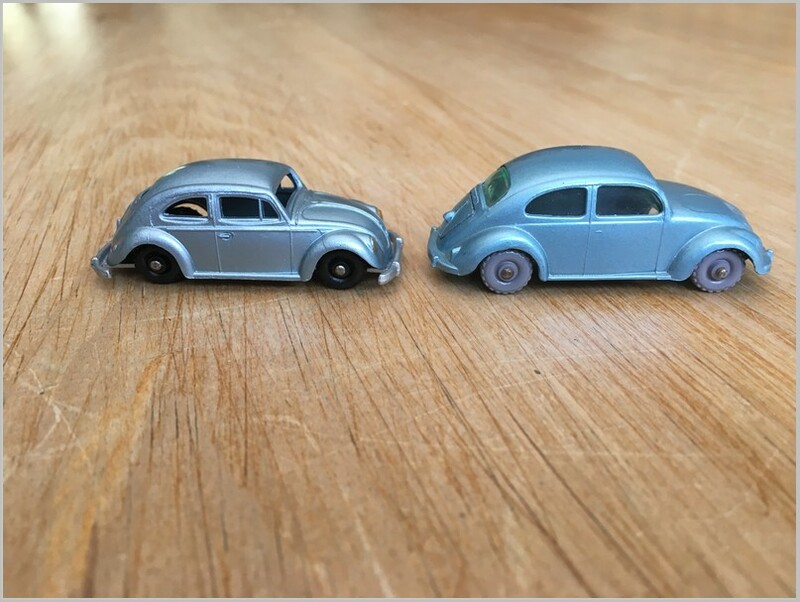 The early originals had metal wheels, just like early Matchbox, but later issues had grey or black plastic wheels. The reissue is only available with black plastic wheels. I have only one complaint, that being, the paint finish. Originals would have been heat/oven treated for durability as toys, but the reissues are merely sprayed from a can. The paint is fragile and chips easily. But that is a minor criticism, as these are now being produced as collectors’ models and not toys. I would love to see more reissues of the small Budgie range, even if it might generate similar criticisms to the Atlas Dinky range. Firestone Tires logo is a decal. Fit over trailing edge of door is good but not perfect. Careful handling required so as not to damage decal. From Internet Posting copyright recognised. 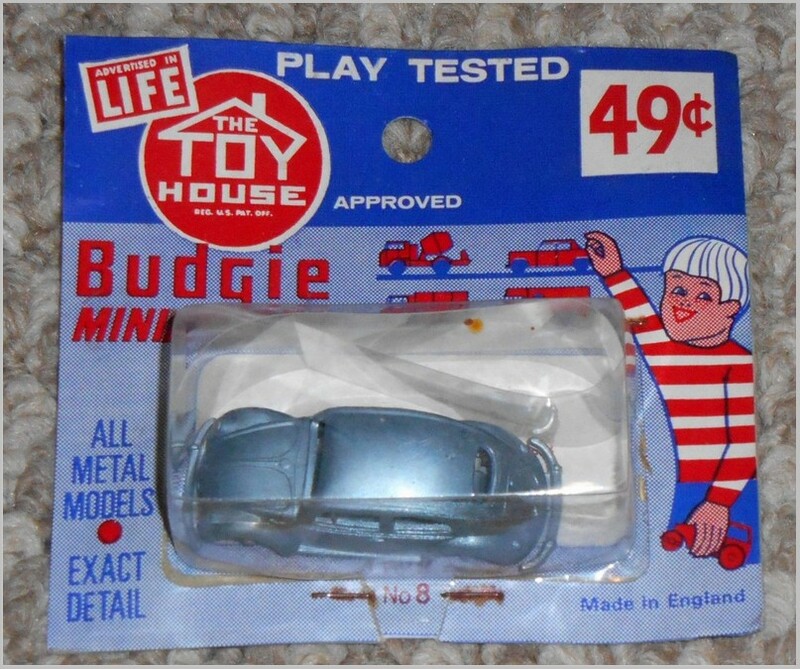 Some original Budgie blister packaging for the US market (photo internet). Some Budgie copies in white metal kit form included here for fun. Wizard (Australia), left, a rather poor casting with lots of flash and no quarter window. Centre is Steve Flowers RADDS line, a superb casting. Right is Midget Models from UK, also a very clean casting. 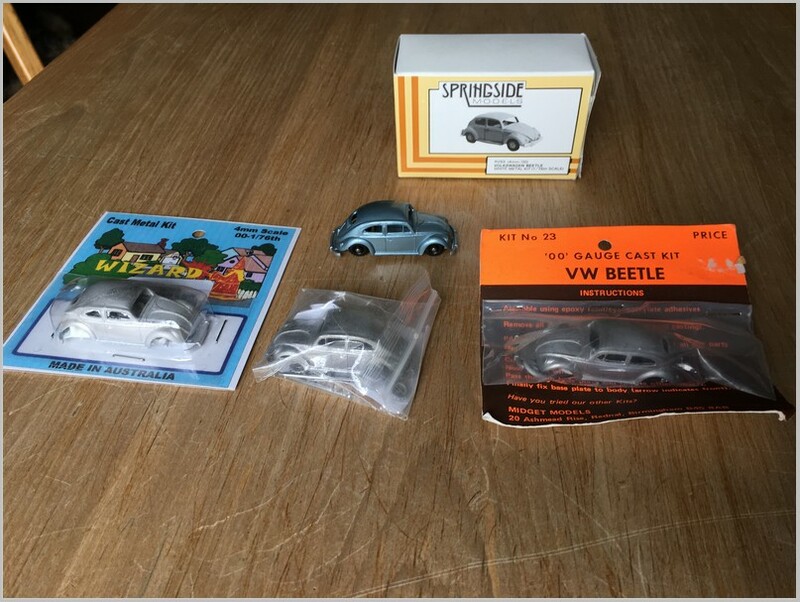 The Springside at top is actually not a copy, but is a “square window” Beetle kit in roughly the same size. I would like to live long enough to build these some day. 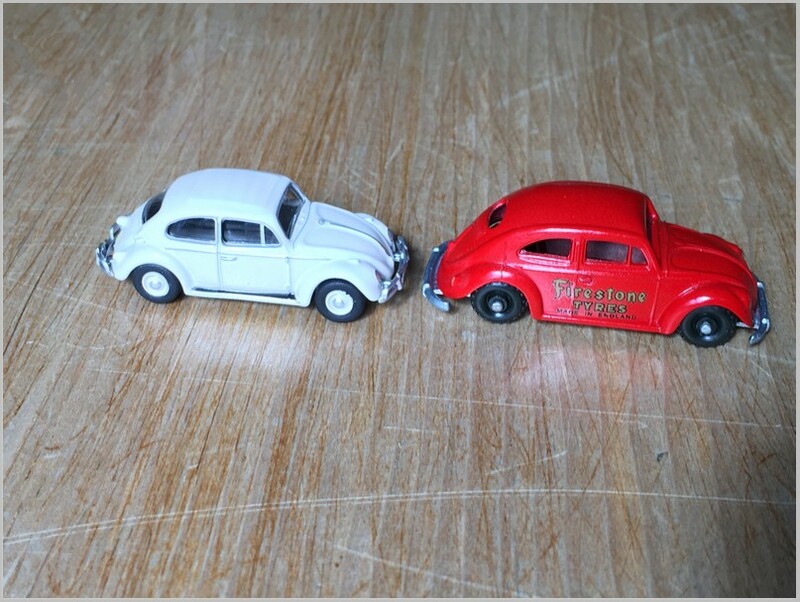 Side by side with the Oxford Diecast square window Beetle. The OD has a better overall finish, but could take some casting lessons from Modern Products here. The quarter window is painted on the “glass” for the OD, but finely cast on the Budgie. 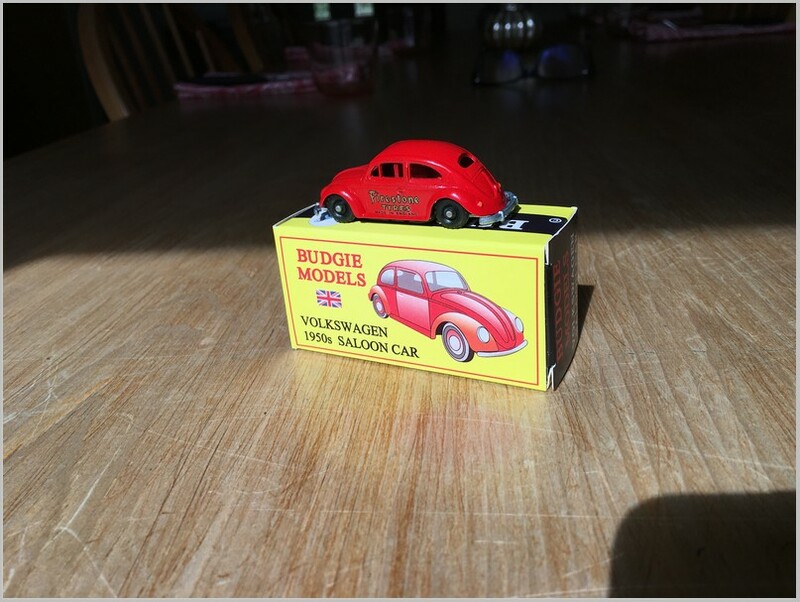 Most references call the Budgie 1:76 scale, but it is larger than the OD. I’ll give OD the nod for scale accuracy here, which would probably put the Budgie between 1:75 and 1:72. 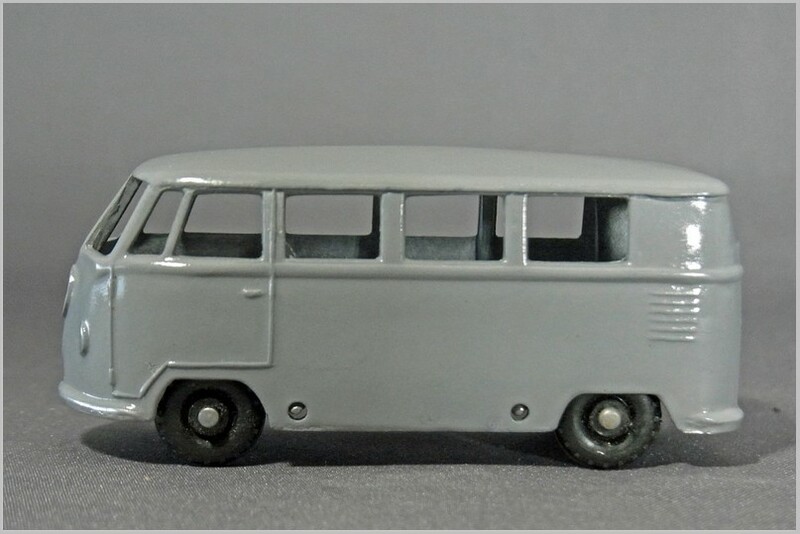 Matchbox usually gets high marks for casting finesse, but is surpassed here by the Modern Product effort of 1956. 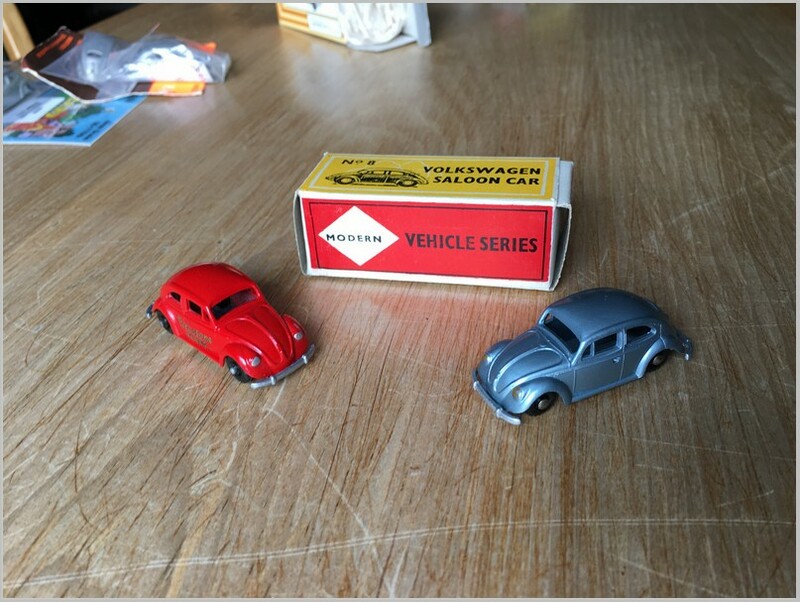 The Matchbox is a 1960 issue. OD could take some more lessons here, not on casting, but on fit of windows on the Matchbox – nearly flush.